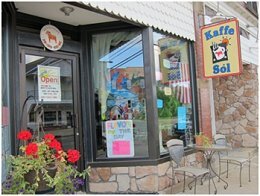 Serving breakfast and lunch seven days a week at Jewett’s Kaffe Sol on 1 West Main Street along Scenic Route 6 in Mt. Jewett, Pennsylvania — just minutes from the Kinzua Bridge State Park and the Kinzua Sky Walk. Enjoy a latte, cappuccino or teas and coffees in many wonderful flavors like, crème Brule, snicker doodle, blueberry cobbler and Chai. Sit inside or out while indulging in Kaffe Sol’s signature cinnamon rolls, blueberry sconces or Swedish Rye Bread. 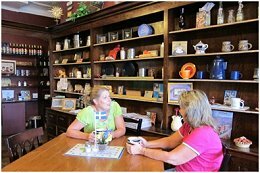 Friendly owner Connie Carlson and her team will make your stop relaxing and enjoyable for the whole family. Planning a party or event? No problem – call Connie and she will cater your event. You can also order take out. Motor coach and group tours are welcome with prior reservations. Programs can include Viking performances and Connie will meet & greet your guests in Swedish costume.